Well it’s official. The new Death Note II: The Last Name film will air in almost 400 theaters across America on October 15 and 16 at 7:30pm! Fathom events is handling it again of course. Advance tickets can be ordered on August 29th for members of Viz Media’s Shonen Jump magazine. The general public will be able to pre-order tickets on September 5th. Check out Viz Media’s website for the official trailer for the second film, Death Note II: The Last Name. 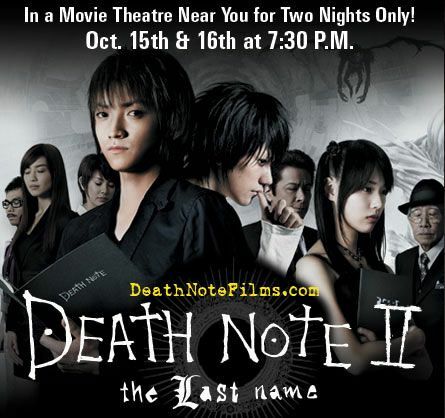 To find the nearest theater that will be showing Death Note II: The Last Name, here’s the final movie theater database. For those of you in Jacksonville, Florida, you will find me at AMC Regency Square 24 Theater! Remember to stay after the film to see the making of Death Note II. The first movie’s making of was well worth seeing.